We invite you to browse our web site to learn about our various County offices and the services Pierce County, Nebraska offers its citizens. Courthouse hours are from 8:30 - 4:30 Monday - Friday except on holidays. Pierce County is in the process of hiring a Financial Contractor and Advisor to work with Pierce County and FEMA/NEMA to submit and procure claims for the 2019 Flood Damage/DR-4420 in Pierce County. Resumes must be received by Monday, May 6, 2019 at 9:00 A.M. at the following address: Shannon Wragge, Pierce County Clerk, 111 West Court St., Room #1, Pierce, NE 68767, phone 402-329-4225 or may be submitted via email to: piecoclk@ptcnet.net and will be considered at that time. Pierce County Road Department will be mowing all county roads, excluding minimum maintenance roads, in June and again in September for 2018 (SS-39-1811). If there is planting within the county right-of-way (33’ from center of road) it will be mowed (SS-39-1702 and 39-1812). It is also the responsibility of the landowner or farmer to see that no irrigation water infringes on county right-of-way/road. Violators will be prosecuted. The Pierce County Assessor's Office has made their records available online. Records are searchable by Owner, Parcel, Address, Legal Discription, and sales data. The Pierce County Register of Deeds records are now available online. Drivers Exams are given on TUESDAYS from 9:45 AM to 12:00 PM and 1:00 PM to 4:00 PM. CDL DRIVING tests are NOT given in Pierce County, but written tests are. CDL DRIVING tests are given in Madison and Holt Counties. If you have questions or concerns please contact the Pierce County Treasurer's Office at 402-329-6335 or go to http://www.clickdmv.ne.gov for more Nebraska motor vehicle information. 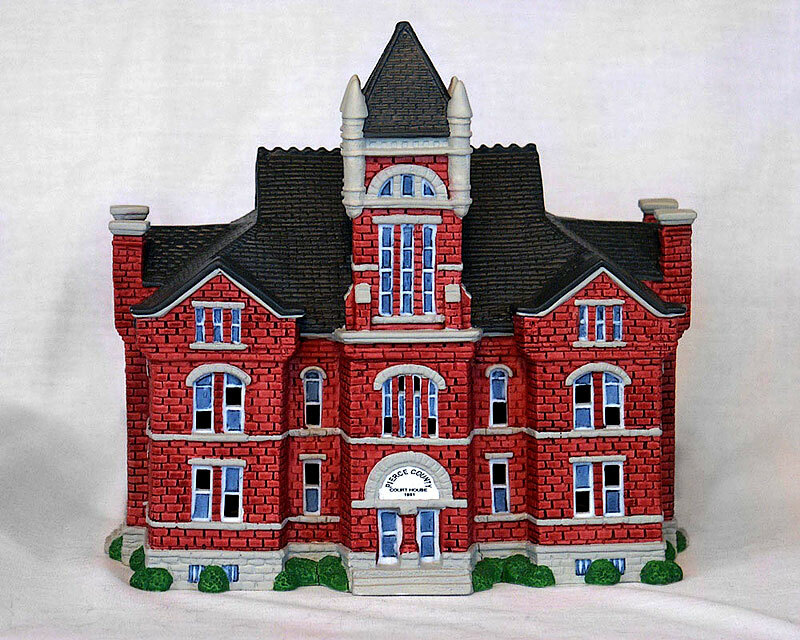 Replica's of the old courthouse are now on sale for $20.00, please contact 329-4225 if you have questions. Plat Books are also available, please contact the Clerks office for pricing. Zoning Fees will change, effective July 1, 2011. More information is available in this News Release. Individuals should receive property tax notices in mid-December. The notices will be received from the County Treasurers office, 329-6335. If you have questions regarding these notices more information should be available from the Treasurer's office. The Assessor's office is in the process of finalizing the Real and Personal Property Tax List. Information on the tax list and the levy list which was finalized in mid-November is available from the Assessor's office, 329-4215.